Who said you can’t drink and drive? Not only does the Octane 120 Beer Arcade Machine ($6,000) support it, it even includes a kegerator behind the rear seat — with a secondary tap in the dash — so you don’t have to pull over to get a refill. 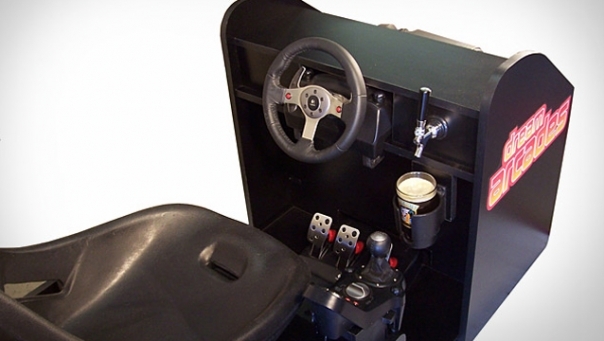 Other features include leather wrapping on the fully adjustable, force-feedback steering wheel and on the seat, metal gas, clutch, and brake pedals, a Full HD projector up front, an integrated gaming PC with 200 racing and arcade video games and PS3 connectivity for good measure, a conveniently placed cup holder, and the ability to swerve with impunity.